There are so many different types of buildings in London as they span different eras of design that we find ourselves here at Shutterly Fabulous designing very different bespoke shutters in London for each of our customers. The plantation shutters in this London property are fitted to four separate sash windows. We often fit to sash window openings. Our London customer’s shutters are each made with one shutter panel opening left and one shutter panel opening right. Each of the Shutters on the London sash windows has 89mm slats. Shutter slats come in a variety of sizes. There are 45mm slats, 64mm slats, 89mm slats and 114mm slat sizes. Most of our customers choose either 64mm slats or louvers for their shutters, or the 89mm slats. There is no right or wrong for which slat size you choose, but larger slats when opened wide at their open position would certainly decrease privacy at the window, and the smaller 45mm slats would increase the privacy on the same sized window when at their open position as there would be more horizontal wood at the window.The shutters in this property pictured have two panels, one opening left, 1 opening right, and they have a mid rail situated at the point where the sash meets in the centre. 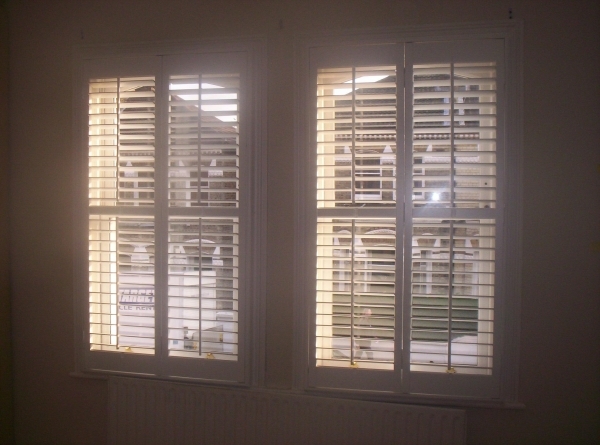 The mid rail in the centre of the London shutters in the picture has two main functions, one which is that it covers the natural break in the sash where the top sections meets the bottom section, also it allows the push rod which operates the slats opened and closed to have a break in it. This allows our London shutters customer to operate their top slats independently from their bottom slats. This means that there is more control over the light which comes in through the shutters, and allows a bit more flexibility as to how the light is directed and angled when it comes in. These shutters are painted in the softer Cloudy White rather than our brightest white paint finish. The customer has chosen Poplar wood which is from an FSC certified source. Why not see if we can help you with your shutters, use our online quote form or give our sales team a call to get a quote for your windows.